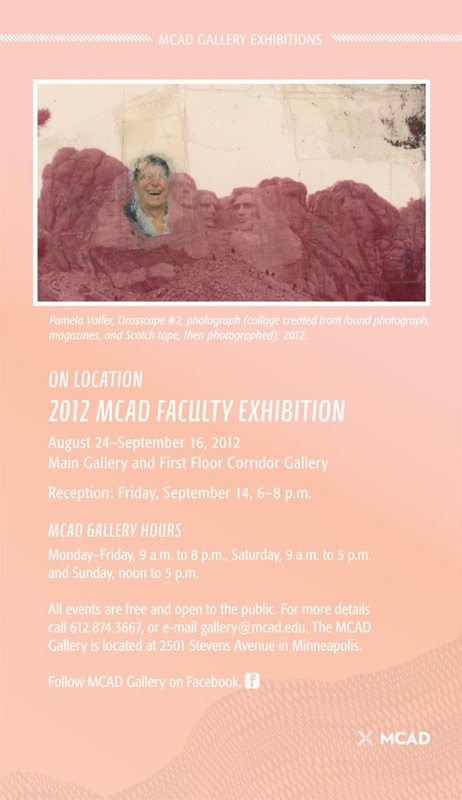 Come see my recent work at the MCAD faculty show August 24-September 16. This print and process book are the results of my summer investigation into diggers, the movers and shapers of the earth in my neighborhood. Some diggers are large and loud, they are the construction machines that are building the new central corridor light rail line on University Avenue near my home. Some diggers are small and quiet, they are the ants and sow bugs, earthworms and millipedes that turn and renew the soil in my backyard. 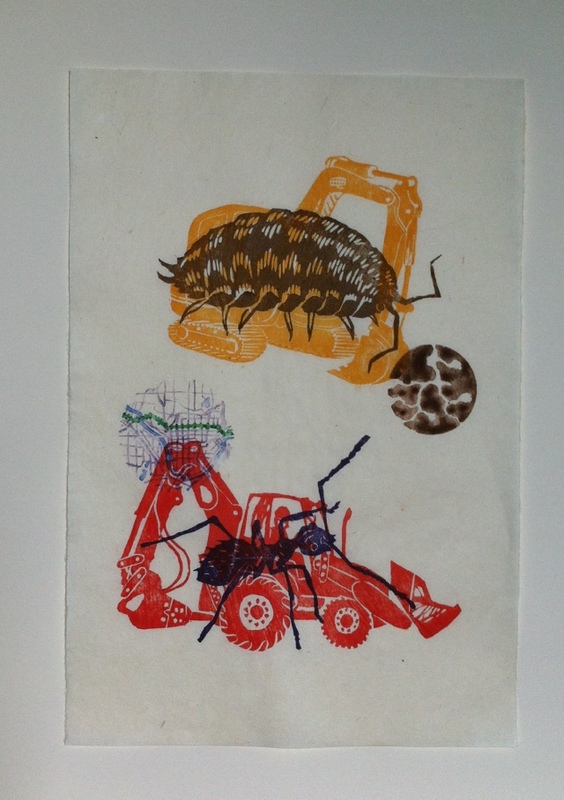 In this print, I have distorted scale in order to make the small diggers and large diggers the same size and importance. These diggers create the infrastructure of my city and the structure of the soil, both profoundly shaping the way I live in this place. The process book contains a summer’s worth of drawing on location with my two-year-old son as I researched and gathered imagery for the print. Some drawings in the book are his and some are mine, but most contain marks made by both of us as we tried to capture the quick movements of the industrious diggers. This is different imagery and subject matter than I usually work with, but it was a nice change of pace to work with a medium that brought its own associations with it. This piece will be for sale along with other altered book covers and other “bookish” art at MCBA’s Unabashedly Bookish Bash on July 28, 2012, 7-10pm. This is a benefit event to raise funds to match a grant from the NEA for MCBA’s artist programs. 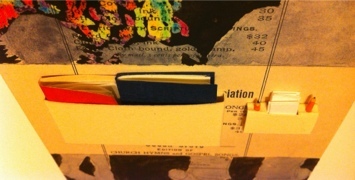 See http://mnbookarts.org for more details. If you buy this piece you can write your own tiny hymns or liturgy in the little books! 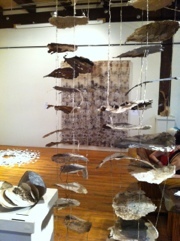 On Friday, I went to Jil Evans’ opening at Form and Content gallery. Her paintings are beautiful. 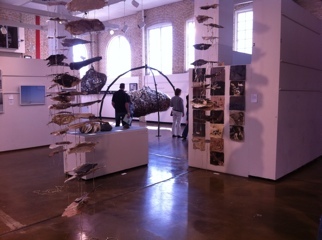 On Saturday, I went to see the art show at the Living Green expo. this video by Kate Casanova showed hermit crabs exploring a person’s head, and the photograph had mushrooms growing out of a chair. I have been interested in her work since I first saw it at MCAD. 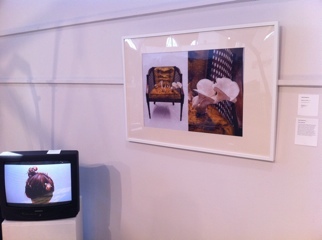 Today I installed work at the art show in conjunction with the Living Green Expo. 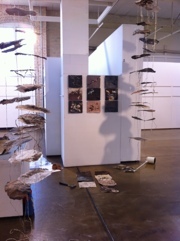 It felt good to see my Tending to Decomposition series up again. It makes me think that I want to keep making art like this. But I also feel that I am so happy with the way materials, process, form, and content worked together in these, that I wonder why make more? 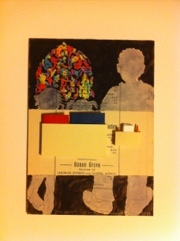 I wonder if I need a seed of discontent with earlier work, a problem to solve, to motivate the next piece? I made a new version of His Roots this week, adding more blue gradation in the background and a pink gradation in the placenta. So, now it’s been two months since I posted that I would be back to updating this blog regularly, feeding the creative process. 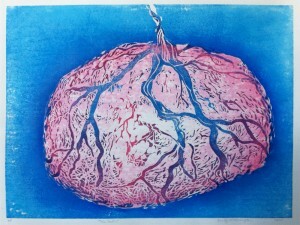 I finished the print “His Roots” a long time ago, and am happy with it. It is in a print portfolio that will have a show sometime next year. In order to keep making work, I think I need to commit to participating in at least two print portfolios per year after this. I am satisfied with being a mother and being a teacher. My students at MCAD are now working on their final projects, printed books. My son is crawling. I get so much satisfaction from facilitating and observing other people’s learning, making and becoming. 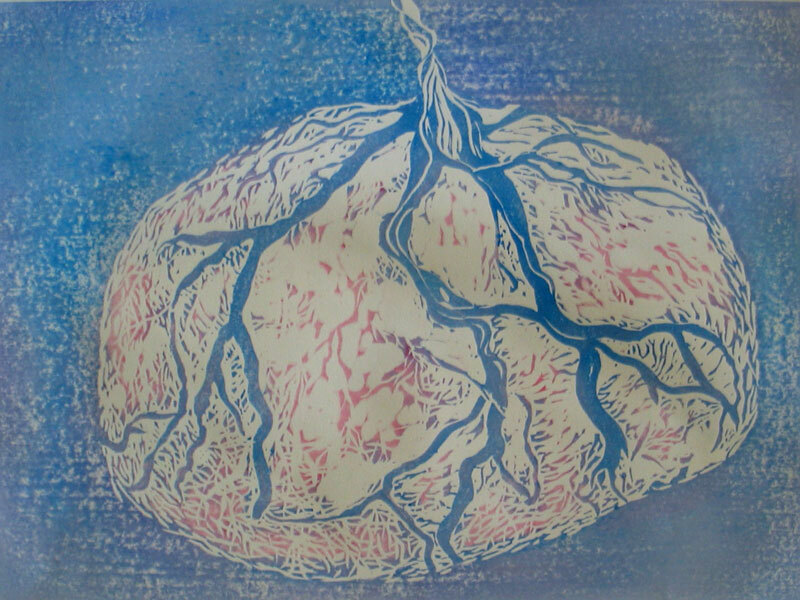 The question for this blog is how to facilitate my own learning and making. Part of it is a matter of time management. It’s hard to focus on making art when I am hungry and need to wash dishes in order to make food. Part of it is also a matter of motivation. Seeing my students or my son interact with me and the world motivates me to invest more time in watching them and helping them. In order for my art to motivate me to spend more time with it, I have to spend time looking at what I’ve made before and remembering why I made it. Also, in the midst of the clutter of a house that seems to be impossible to baby-proof, it’s difficult to be motivated to make more physical objects. 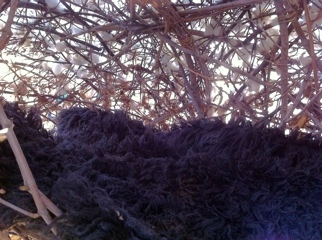 So, perhaps I need to find ways to work that are more ephemeral, more recyclable? Or to tap into the motivation I get from working with other people and find ways to work that are more collaborative? Cracked and Inhabited, 2007, 20x15”, Japanese-style water-based woodcut. Here’s another past print inspired by the worms in my compost. I would often find a cluster of them hidden inside an eggshell. 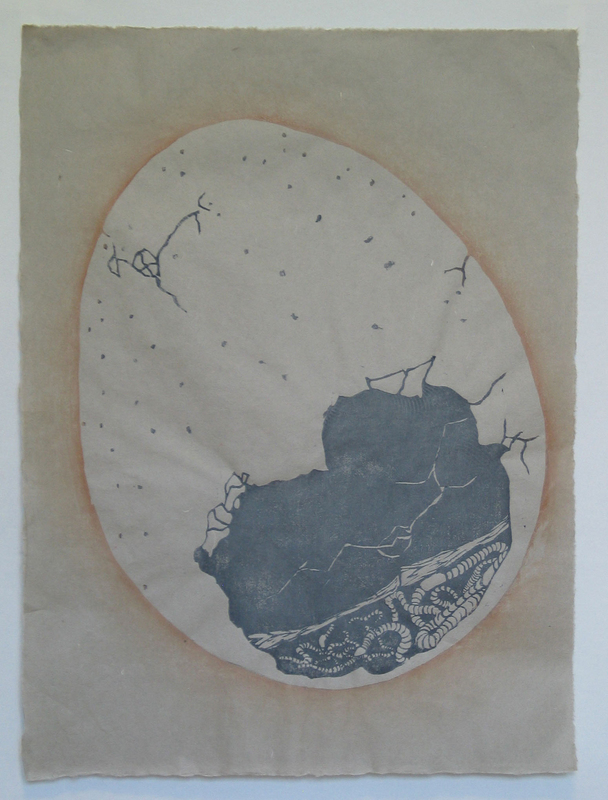 The eggshell to me in this piece is a delicate, damaged, and beautiful world. I discarded it and then the worms found and re-purposed it as their shelter, and perhaps even a safe place to mate, making it once again a place where life is renewed.